This course is currently full . . .
. . .but you may register to add your name to the waiting list. Additional dates are being planned. Please indicate your preference/availability for the new dates on the registration form. This Python workshop is capped at 30 participants, and is on a first-come/ first-served basis. 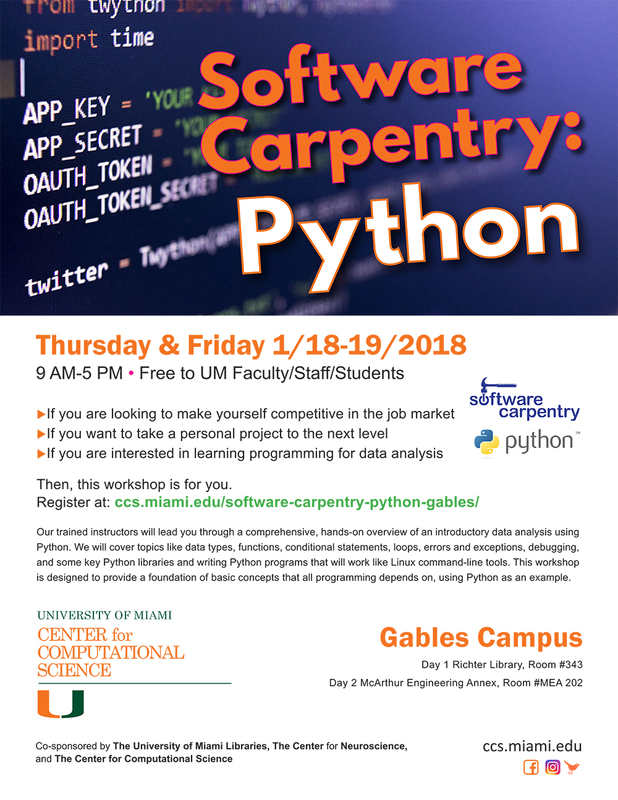 Brought to you by the Center for Computational Science (CCS), the Miami Clinical and Translational Science Institute (CTSI), and the Graduate School, this 2-day workshop will provide you with the basic computing skills and best practices needed to be productive in a small research team. The format is a mixture of short seminars and hands-on practical exercises, and participants are encouraged to help one another, and to try applying what they have learned to their own research problems during and between sessions.